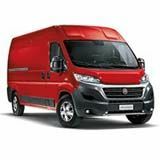 The third generation Jumper/Relay was launched in September 2006, followed by the Boxer in June and the Ducato later that year. The vehicle was available in many variants both for people and goods transport. Weights were again increased, with the following designations for all-up weight: Ducato 30 (3 tonnes), Ducato 33 (3.3 tonnes), Ducato Maxi 35 (3.5 tonnes) and Ducato Maxi 40 (4 tonnes).